Dining table in walnut with two leaves, angular leg design, by Edward Wormley for Dunbar, American, 1950s (signed with Dunbar metal label on bottom). Without leaves: W 60 inches. 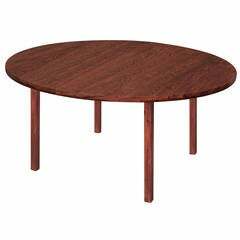 Round dining table in Brazilian rosewood designed by Edward Wormley for Dunbar, American, 1960s (Dunbar tag on bottom) Refinished. Dining table with sculptural Lucite base and glass top, American, 1970s. Wheeled dining table with two leaves by Edward Wormley for Dunbar. Markings: Remnants of Dunbar label.